HOT !!!! VERY HOT !!!! This place better be air-conditioned , I complained to Laura as we made our way to Acushnet . This hot Saturday afternoon we were headed to the BLUE POINT RESTAURANT , a place we'd never been but that I had read wonderful things about . 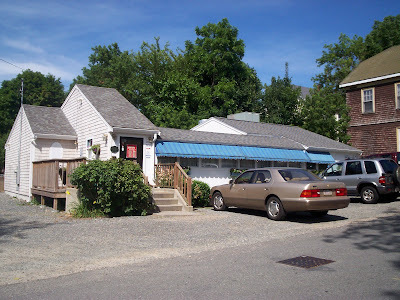 We had our AC cranked as we followed our GPS to a little side street right off the main road leading into Acushnet . The main square was in the middle of a summer "fest" and being the 4th. of July weekend , it was very busy . I was hoping we'd find a parking space near the restaurant and we did , right in front of the door . 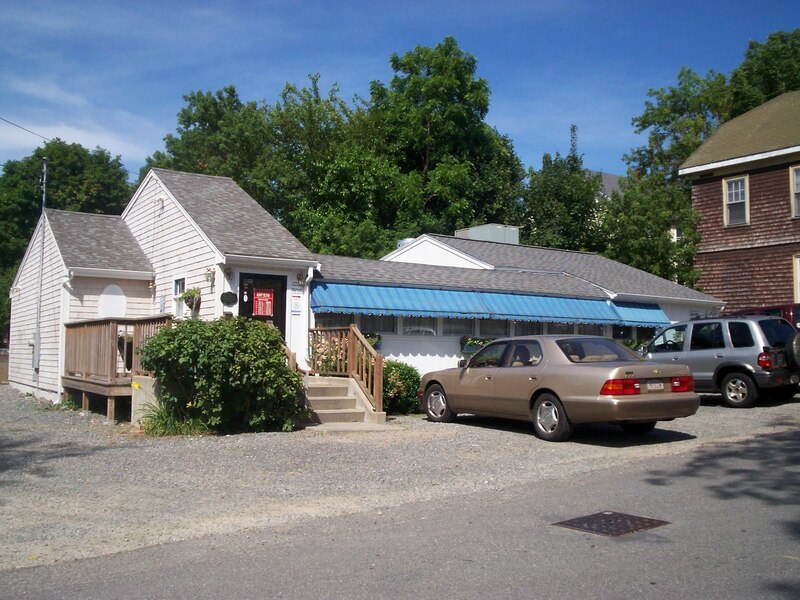 This area of Acushnet is adorable . Looks like a step back in time to a little country town . And BLUE POINT is just a few yards up from the waterway giving us a nice view . We stepped inside about 2:50pm. to find a lovely little room with about a dozen or so tables .And yes , it was air-conditioned . This main dining room was an original Worcester Dining Car from the 30's and you can still see some remnants of the dining car inside . It's done up in shades of sand and blues and makes for a homey comfortable feel . Plus it's immaculate . 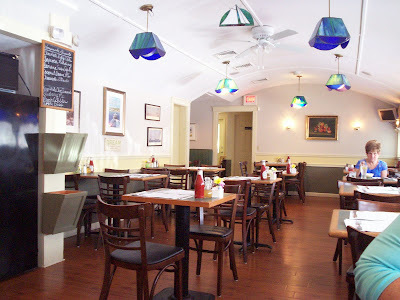 If you click into their website : http://www.bluepointrestaurantma.com/ you'll find the whole story of how they turned the diner into a restaurant . You'll also learn about the RICCARDI family who now runs it . We were able to seat ourselves ( I love this ) by a window and a very nice waitress ( initial D. ) came over to give us menus and take our drink order ....2 - diet Pepsi's. The menu here has a bit of everything , appetizers : (Shrimp Mozambique, Oysters Rockefeller , Crab Cakes, Stuffed Quahogs and wings & things ) , sandwiches & salads , Seafood (New England Clamboil ,Bucket of Steamers ,Lobster Casserole ,Scrod Meuniere and the usual fish & chips, clams & scallops ), pasta dishes ( Spaghetti or Fettuccine Scampi ,Baked Lasagna , Chicken Marsala etc. 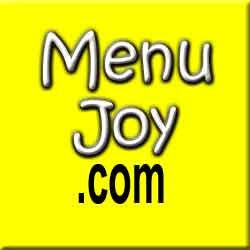 , plus Filet Mignon,Surf and Turf ,Southern Fried Steak and much more .They even have specialty pizzas . And there's a blackboard listing the day's fresh made desserts . 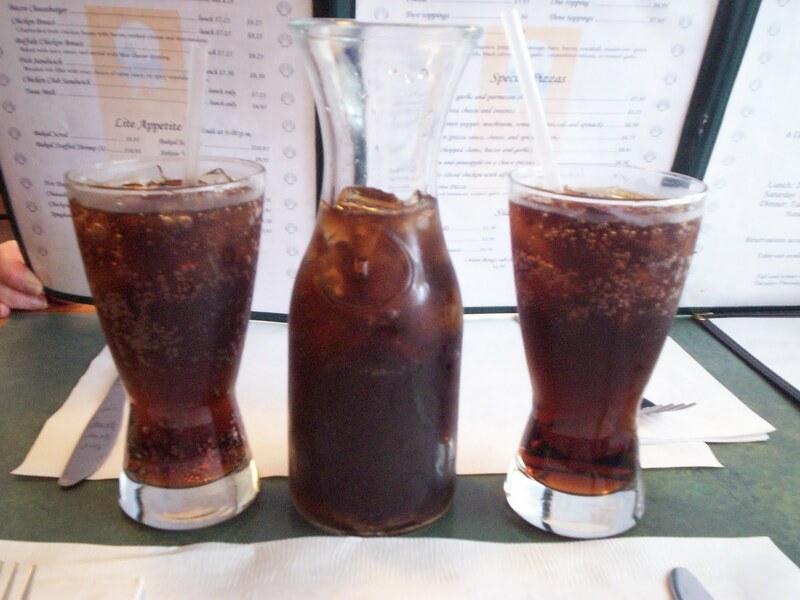 When D. returned with our drinks , we were delighted to see 2 tall glasses filled with Pepsi , plus an extra carafe also filled to the rim . What a nice presentation . She also placed down a nice basket of cornbread and said the rolls would be coming along soon . So far so good . Then she took our order . We decided to start with the Italian cheese sticks / marinara sauce and keeping with the Italian theme I chose the luncheon portion of the baked lasagna .For an extra dollar , I got the minestrone soup to go with it . Laura decided on the Kelly's Marguerita Pizza which was Alfredo sauce, sliced tomatoes, roasted garlic, Parmesan cheese and freshly chopped basil. 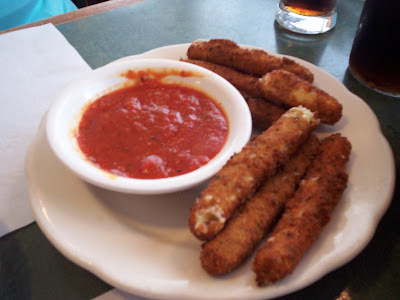 Our cheese sticks and my minestrone soup came out first . We both marveled at the coating on the sticks . 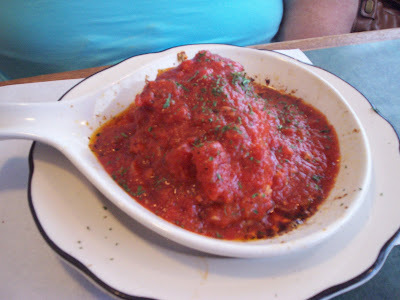 Instead of the breadcrumb coating you usually find on these things , ours were covered in Italian spices and the marinara for dipping was chunky , homemade and delicious . What a great start . And my soup was outstanding . It didn't have a strong tomato based broth like I'm used to getting . The broth tasted meaty but the meat tasted more like a smoked shoulder . 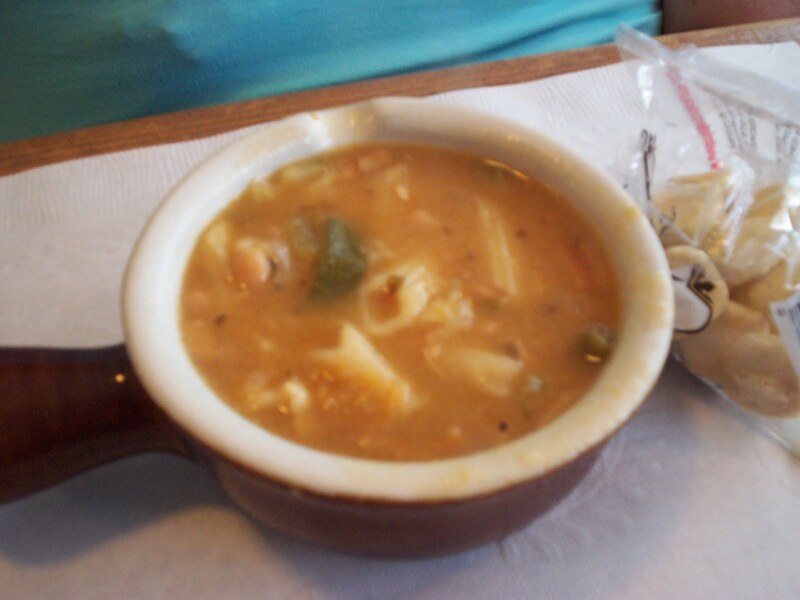 It was filled with veggies and pasta and was such a pleasantly different minestrone . I really enjoyed it . When we were just finishing up with our appetizer , D. came with our food . Boy was I glad I got the lunch portion . My lasagna was a good-sized piece that smelled fragrant as it was heading for the table . And it tasted as good as it smelled .You could tell it was homemade all the way . The noodles , layers of meat and cheeses and that fantastic marinara ....so good . I was so pleased with my choice . And Laura's pizza was a masterpiece . It was as pretty to look at as it was good to eat . 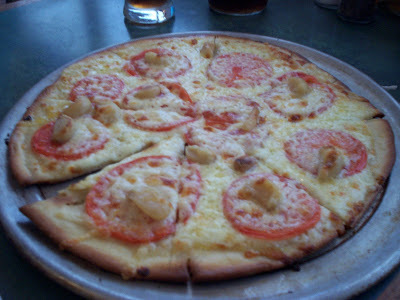 She loved how the thin slices of tomato were disbursed evenly over the top . But her favorite thing was the cloves of garlic , left whole , scattered on top to roast while the pizza cooked . She loved the mild flavor the garlic took on when roasted whole like that . She loved this pizza and ate it all , as did I with my meal . What a delicious lunch ! 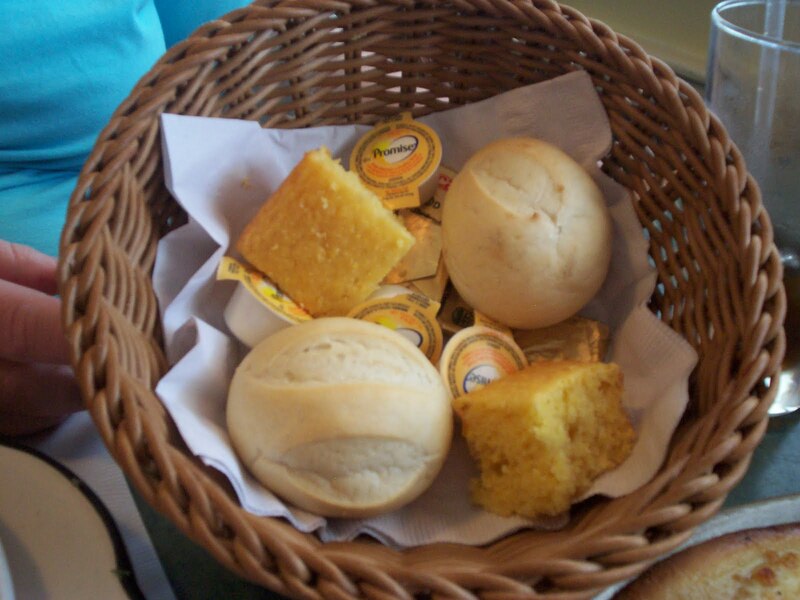 Oh yeah , and D. brought by another basket with rolls and cornbread . You surely won't leave here hungry . When we were completely done D. came by to see if we wanted dessert . Although the dessert board was tempting , we couldn't eat another thing and D. kindly dropped off the bill . Not bad for such a glorious meal . After leaving a 20% tip for D. ( who couldn't have been nicer or more efficient ) we left $ 34 on the table and started heading out into the hot weather again . But first , as is our habit , we checked out the ladies room . It was roomy , pretty and immaculate , just as I thought it would be . 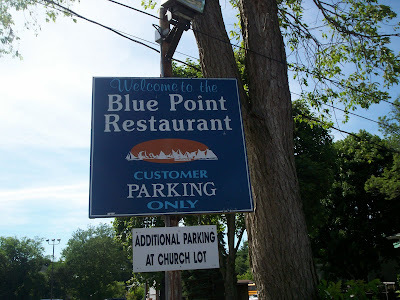 You have to visit BLUE POINT RESTAURANT . You just have to . Especially if you want to see me . Cause I'll be going again and again . The Blue Point Restaurant is open for lunch from 11:30 a.m. to 4 p.m. Thursday and Friday, and 12-4 p.m. Saturday. They are open for dinner from 4-9 p.m. Tuesday through Saturday, and 12-8 p.m. on Sunday. Fall hours are until 8 p.m. Tuesday through Thursday.